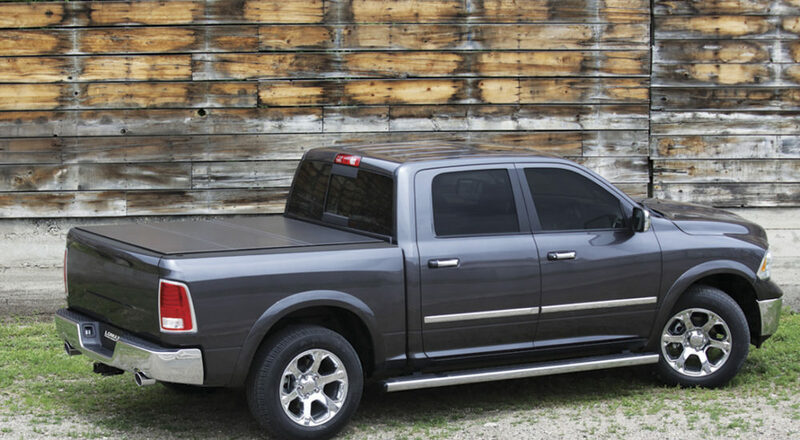 Take full advantage of your truck bed space without sacrificing security with a LOMAX™ hard tri-fold tonneau cover. It’s designed for strength, style, and security. The aluminum alloy construction means that even LOMAX™ can hold as much as 400 pounds, it will still be light enough for one person to install and operate. Normally a tri-fold cover sits on top of the bed rails but this truck bed cover is designed to fit between the rails with an ultra-low profile. The matte black finish is specifically formulated to complement your truck’s OEM bed rail caps and provide a sleek, modern look. Reinforced hinges coated with vinyl are waterproof and route water away from your cargo without any gutters or drains. To open, pull cord from either side to release latches; folding each panel automatically disengages additional locks. Then, secure LOMAX™ Hard Tri-Fold Cover with integrated storage clips. To close, release storage clips and use built-in handle to unfold panels. The tonneau automatically locks at ten points when closed, keeping your cargo protected and out of sight. The water-shedding design and waterproof, reinforced vinyl coated hinges route water away from the bed without gutters or drains. The hard folding tonneau overlaps the bed rails with a continuous seal along the entire length of the side rails, preventing elements from entering the truck bed. tight, while reducing wear and tear.